Sugared Cranberries are a great way to dress up desserts or drinks and are perfect for holiday snacking. 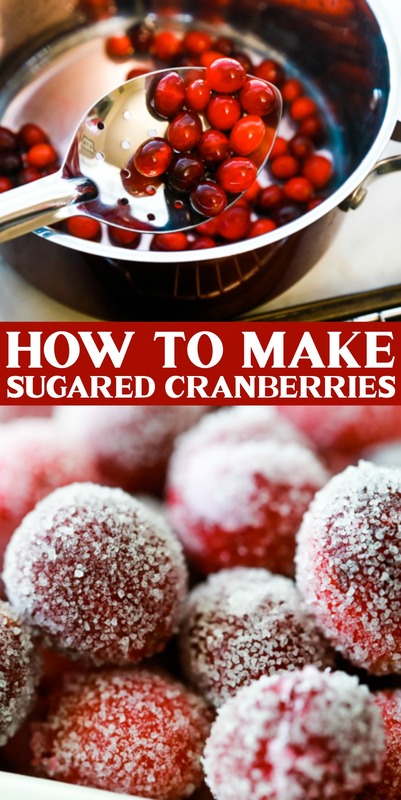 I’ll teach you how to make Sugared Cranberries with just 2 simple ingredients. I love the way that Sugared Cranberries totally transform my favorite drinks or my favorite holiday desserts. There’s just something so perfect about sparkly, glittery cranberries, y’all. But they’re not only perfect for adding to your favorite drinks and desserts, they’re perfect for a quick little sweet + tart holiday snack. I love the combination of the tartness of the cranberry with the sweetness of the sugar. YUM! Sugared Cranberries are so easy to make. When I learned how to make Sugared Cranberries, for some reason I thought the process would be much harder. But it really is quite simple. 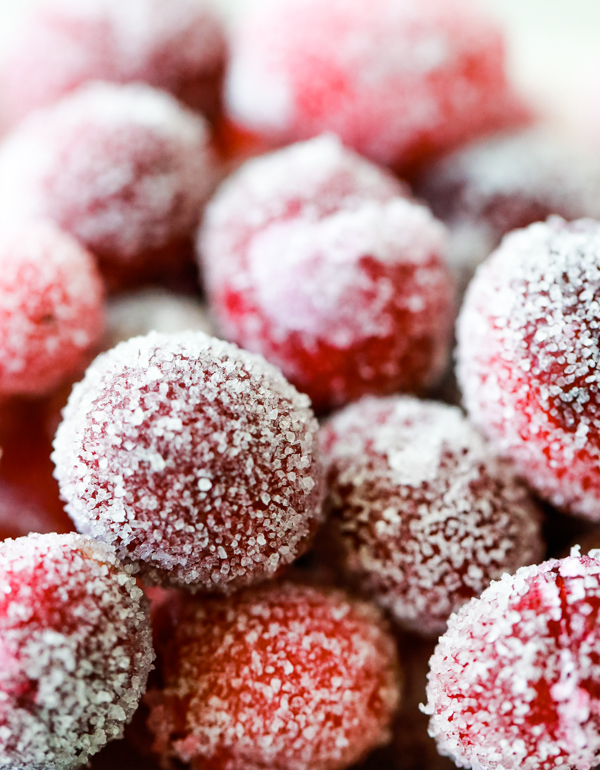 To make Sugared Cranberries, all you need is 2 ingredients, not including water. I don’t really consider water an ingredient, but if you want to get technical, I guess it’s 3 ingredients. If you’d like, you can simply snack on this delicious holiday treat. But if you want to use them in a variety of holiday dishes, I’ve found some great ways to use them. 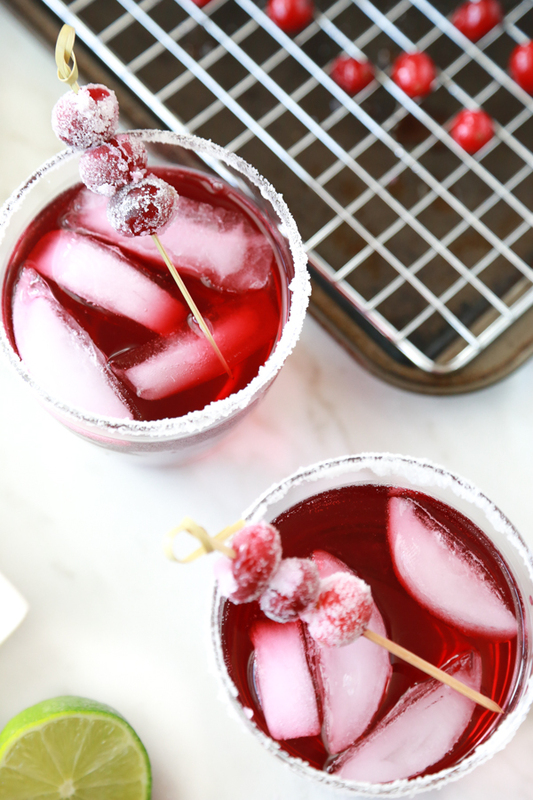 Holiday mocktails are a great way to show-off your Sugared Cranberries. They make the perfect garnish for all your holiday drinks. Scroll down to the bottom of this post for a printable recipe card. Now that you know how to use Sugared Cranberries, it’s time to learn how to make Sugared Cranberries. 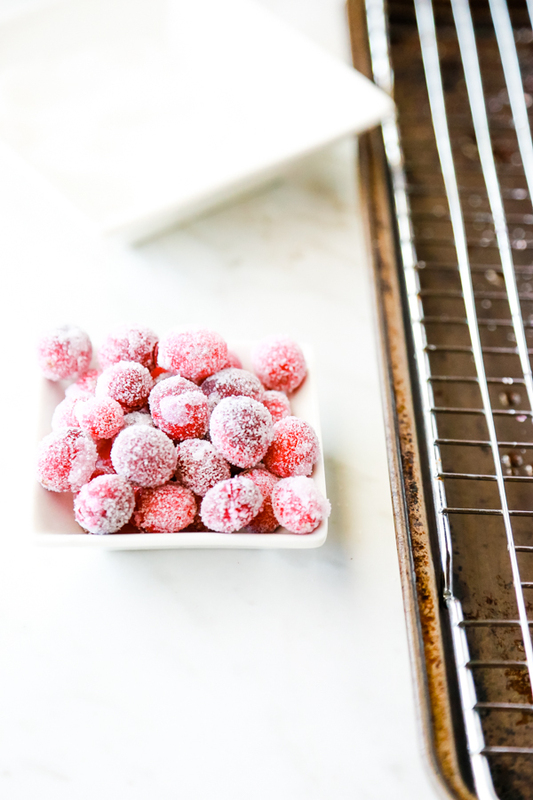 I’ve tried different methods for making Sugared Cranberries, and the method I’m going to show is my favorite. 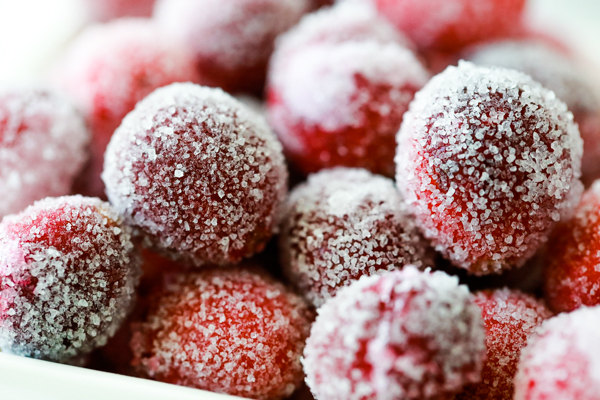 This method gives you beautifully, evenly coated Sugared Cranberries. Pour 1/4 cup granulated sugar into a small saucepan with 1/4 cup of water. Heat on medium until the sugar is fully dissolved and the mixture starts to boil. 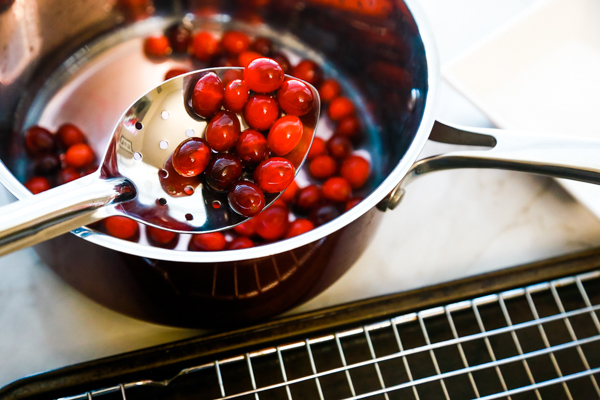 When you see bubbles, remove from the heat and pour in the fresh cranberries. Stir gently to make sure all the cranberries are coated in the sugar syrup. 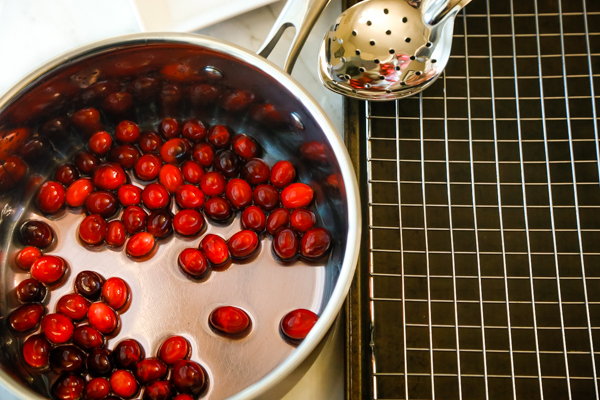 Place the covered cranberries on a cooling rack and let them dry for about 10 minutes. Make sure that you take the time to separate the cranberries so that they aren’t touching. Once they’re dry and sticky to the touch, toss a few at a time into a small bowl filled with the remaining granulated sugar. You can use other sugar, but personally, I like the way the granulated sugar looks. 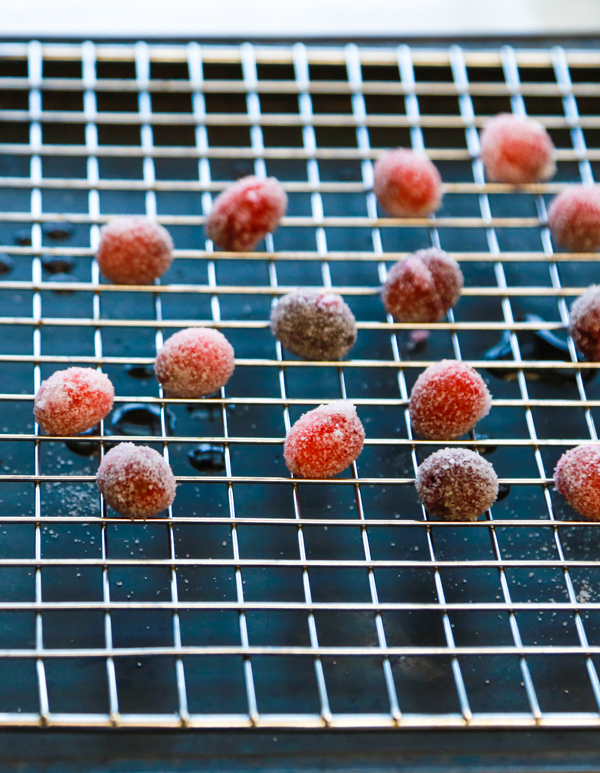 Return the sugared coated cranberries to a clean cooling rack to dry and harden. Allow to rest at room temperature for about an hour or so. Refrigerate until ready to use. For this recipe, you want to use fresh, firm cranberries – they hold up better. You want the cranberries to be completely dry, yet sticky. If the cranberries are still really wet from the sugar syrup, you’ll get clumps of sugar on the cranberries. Don’t rush the drying process. It’s worth it – I promise. Also, it’s best to handle the cranberries as less as you possibly can. The more you handle them, the less sticky they’ll be. And you want them sticky so that all that sweet sugar will adhere nicely to give you perfect looking Sugared Cranberries. Carefully lift the sticky cranberries from the cooling rack and then put them in the sugar dish. Scoop the sugar over the tops of the cranberries and press down lightly so make sure the sugar sticks. 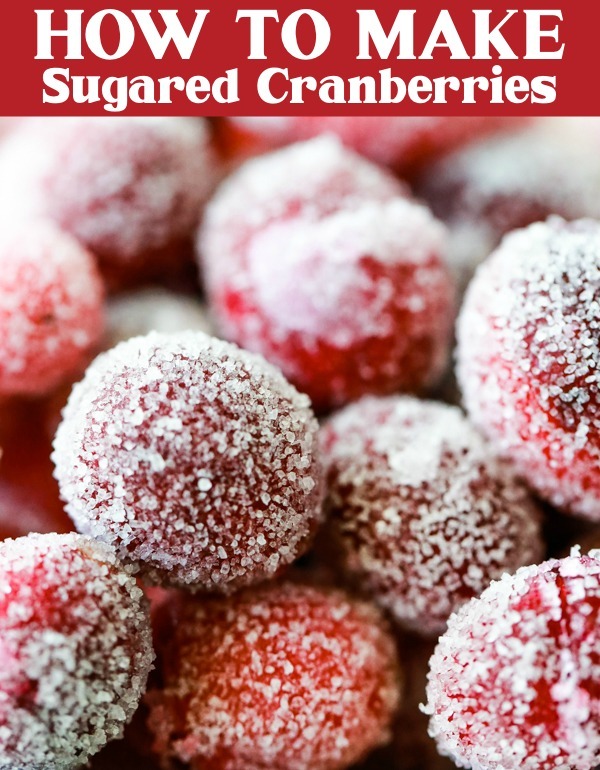 If you liked this Sugared Cranberries recipe, don’t forget to pin it to one of your favorite Pinterest boards. Let the cranberries sit in the sugar syrup for about 5 minutes or so, occasionally stirring, then drain using a slotted spoon. Place the sticky cranberries on a cooling rack and let them dry for about 10 minutes. Make sure that you take the time to separate the cranberries so that they aren’t touching. Once they’re dry and sticky to the touch, toss a few at a time into a small bowl filled with the remaining granulated sugar. You can use other sugars, but personally, I like the way granulated sugar looks. 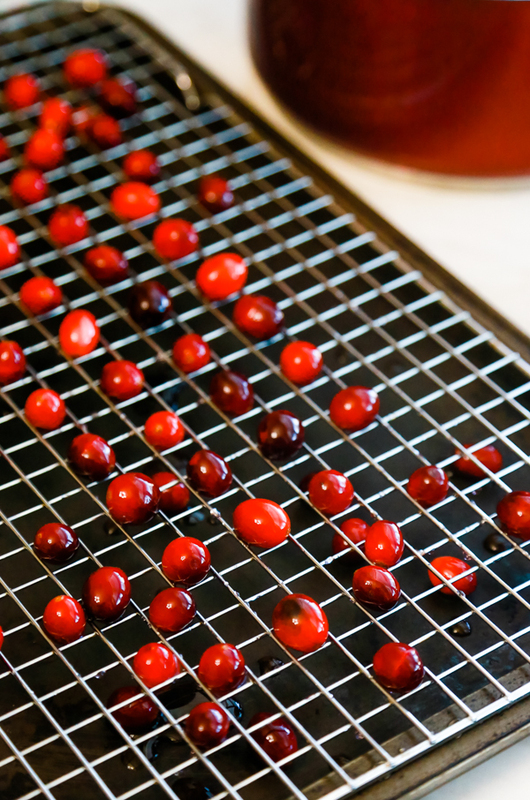 Return the sugared coated cranberries to a clean cooling rack to dry and harden. Allow to rest at room temperature for about an hour or so. Refrigerate until ready to use. If you're making any holiday mocktails or teas, the addition of the leftover cranberry simple syrup would taste divine.